The sound of three sopranos - unique, brilliant and sensuous, captivating the ear and moving the heart today as it did in the courts and churches of Europe in the 16th, 17th and 18th centuries. 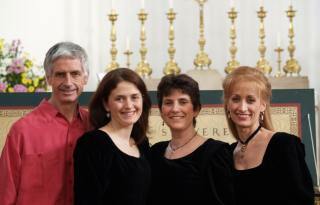 Concerto delle Donne's new CD! This CD was recorded at the end of June 2005 in the beautiful church of Notre Dame, Rozay-en-Brie, thirty miles east of Paris. This church contains a wonderful historic organ of 1690, played by the great François Couperin, which was perfect for this music. 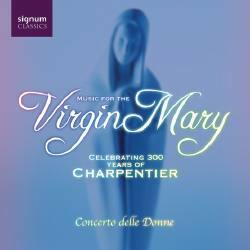 The CD contains the Antiphon Ave regina coelorum, the Magnificat pour le Port-Royal, the Christmas Cantata In Nativitate, and the Stabat Mater pour les religieuses - ethereal, sensuous and yet deeply devotional music. Also included is organ music by Nicholas-Antoine Lebègue (c.1631-1702) and Guillaume-Gabriel Nivers (c.1632-1714) which gives Alastair an opportunity to explore the wonderfully vivid colours of the organ.